Dr. Arif Khan is Specialist Pediatrician who recently joined Marina Medical Center in Sharjah. 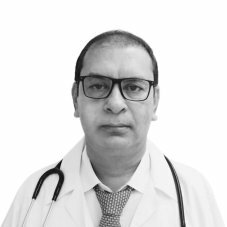 He has a total of 20 years immense experience in the field of Pediatrics. After his Masters in Pediatrics, he joined B.P. Koirala Institute of Health Sciences as Senior Resident in Nepal. Later he joined Security Forces Medical wing as a Registrar in Pediatrics for a period of 6 years. Dr. Arif also worked as a Clinical Observer in Royal Hospital for Sick Children in Glagow, UK in 2009. Before joining GHI, he was working in the Ministry of Health, Dammam, KSA. His special interests include: allergic & atopic diseases as well as monitoring growth & development of children.